Mike Boyer experienced both fame and infamy in the past year. 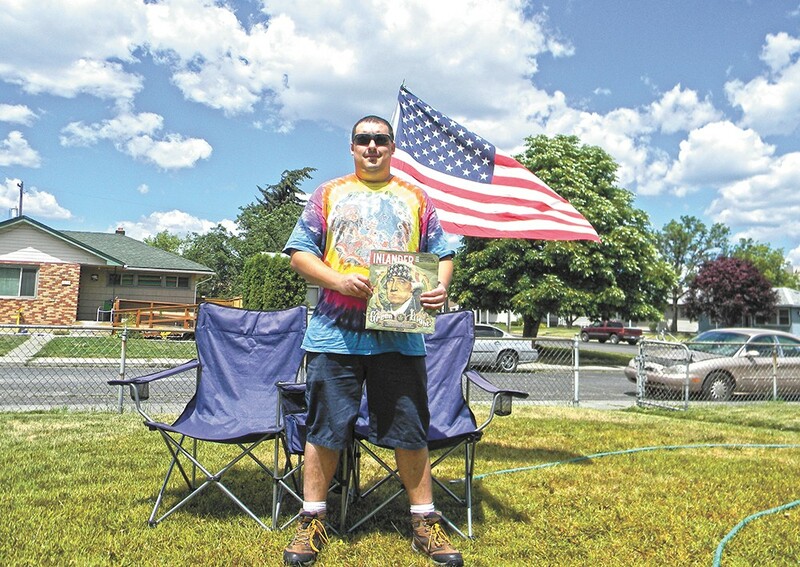 All Mike Boyer wanted was "bragging rights" when he staked out a spot last July outside of a nondescript store in a strip mall to spend the night. Spokane Green Leaf, the the first recreational marijuana store in Spokane, was slated to open its doors, and Boyer wanted to make history by being its first customer. The next day, Boyer, wearing a tie-dye T-shirt and a big grin, shelled out $52 for two grams of Farmer J's Sour Kush that he triumphantly held above his head as photographers snapped the image. Boyer had bragging rights, but he soon discovered that his unexpected fame had its downsides. "It screwed my life all around," he says. "But I still regret nothing." Shortly after the photo was published, two of Boyer's employers, a security firm and an auto wash, saw the image. Although there's some dispute over exactly what happened, Boyer says he lost both jobs. The story of Boyer's firing was picked up by the national press, with the photo splashed across the Internet. The image, says Boyer, has at times haunted his job hunt. He recalls passing a required drug screen for a job, with the help of a chemical aid, only to have the boss confront him with the famous photo. He's been accused of being "planted here to be negative for the movement." He's been accused of owning massive grow operations and owing money to the IRS. He's been asked to autograph copies of last year's Inlander weed issue. He's received close to a pound and a half of free weed, along with thousands of dollars worth of bongs, T-shirts, Frisbees and stickers. He's appeared on CNN, and he's received phone calls from all over the country, including, he says, from Seth Rogen, Willie Nelson and Jimmy Kimmel. Boyer also landed gigs giving the "stoner point of view" for radio stations in Canada and Florida, and as far away as Australia. He says he had hoped to leverage his fame into speaking gigs across the country in support of relaxing marijuana laws, only to have his public relations agent drop the effort. Despite all the attention, Boyer is just a weed-loving Spokanite. A chatty 31-year-old who wears tie-dye T-shirts until they resemble spiderwebs, Boyer took his first hit in eighth grade from a friend's parent's pipe left in a garage. "I find that it's basically a go-to for everything," he says. "It's kind of a cure-all. Do you just need to relax? Are you trying to be social? Do you need some energy? Are you trying to cure a real ailment or just have a f---ing good time?" Now seeking to get a job in the legal weed industry, Boyer recently wrapped up an internship at a medical dispensary and completed an online budtender certification program. He currently works at a gas station to get cash register experience. He sent out 80 packets to potential employers, with no luck. So in June, he attended a marijuana industry job fair. Hoping to get an advantage, he made a point of being first in line.